Minna Treat lives in Gilbreth, New York, a small town that is very proud of its history and tradition of local artisans. She is being raised by her young uncle, because her mother passed away of a medical ailment and her grandparents were killed in a car accident. There is not information available about her father. Theo, her uncle, wants her to enter the local young artisans' competition, which has always been won by a Treat, but Minna doesn't have much interest in it. Her best friend, Christopher (or "Crash", so called because of his predilection for causing accidents) and new, quirky girl Grace, hang out together and decide to try to discover more information about her uncle. 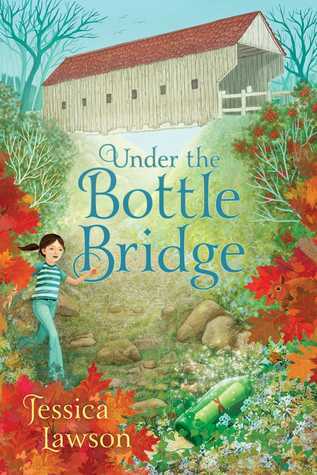 Minna keeps finding bottles with cryptic messages in them near one of the five local covered bridges, and starts to think the messages might be connected with her father. Grace's father, the mayor, wants to start a lot of real estate development in the area, which would cause the woods and some of the covered bridges to be raised, but the town is not very excited about that. Minna isn't, either, even though times are bad enough that her uncle is looking into alternate employment at a town about an hour away. Will Minna be able to find out more about her mysterious parentage, the person leaving her messages, and how to save the town? Strengths: Lawson has done a fantastic job of world building-- Gilbreth is quite a town, with a rich tradition, a history quoted at the beginning of each chapter, and an interesting blend of people. Minna's reaction to her uncle and mother's situation is handled well; not too sad, a bit precocious, but fairly balanced. I can see this being enjoyed by fans of the Penderwick or Melendy family sagas. The cover is gorgeous. Weaknesses: This is overly long, a bit too detailed, and very slow moving for the target audience. What I really think: I will pass on purchase, since I can't get anyone to check out the Penderwicks. This seems like a title that adults will rave about, but most children will bypass. Club CSI is back when pretty, popular girl Whitney asks the group-- especially Corey-- for help because she "feels" she is being threatened. There is no actual wrong doing until the next day, when a picture hung inside Whitney's locker is defaced. The group proceeds to dust for fingerprints, but Whitney is oddly unhelpful. It doesn't make matters any better when Whitney's best friend, Alyssa, brings the group an e mail from Whitney that the group is a bunch of dorks and that she should just ignore them. Eventually, though, Whitney's You Can Draw It account is hacked, and someone buys $100 worth of expansion packs on her parents' credit card. Her parents are not pleased, and ground her. 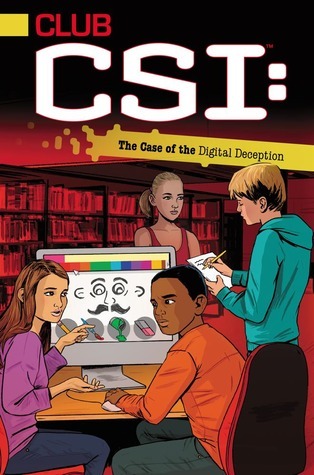 Club CSI steps in with some excellent digital sleuthing, and when they are very close to solving the case, they get some help from experts, including their friend at the local police department who is on hand when they confront the criminal. Strengths: The Case of the Mystery Meatloaf and the other three books in this series have ended up doing VERY well in my library, so I ordered the next two. This is written by a different author, and I liked it a bit better. The digital sleuthing was very interesting, and the inclusion of some middle school drama helped propel the story. Hoping that books 6 is in the next shipment. Weaknesses: Have to decide where to shelve this; will probably put it with the other books by Lewis. What I really think: Fun, quick mystery with a lot of good CSI information.